In 1930, the American historian and philosopher Will Durant wrote that Britain's 'conscious and deliberate bleeding of India'[was the] greatest crime in all history'. He was not the only one to denounce the rapacity and cruelty of British rule, and his assessment was not exaggerated. Almost thirty-five million Indians died because of acts of commission and omission by the British'in famines, epidemics, communal riots and wholesale slaughter like the reprisal killings after the 1857 War of Independence and the Amritsar massacre of 1919. Besides the deaths of Indians, British rule impoverished India in a manner that beggars belief. When the East India Company took control of the country, in the chaos that ensued after the collapse of the Mughal empire, India's share of world GDP was 23 per cent. When the British left it was just above 3 per cent. The British empire in India began with the East India Company, incorporated in 1600, by royal charter of Her Majesty Queen Elizabeth I, to trade in silk, spices and other profitable Indian commodities. Within a century and a half, the Company had become a power to reckon with in India. In 1757, under the command of Robert Clive, Company forces defeated the ruling Nawab Siraj-ud-Daula of Bengal at Plassey, through a combination of superior artillery and even more superior chicanery. A few years later, the young and weakened Mughal emperor, Shah Alam II, was browbeaten into issuing an edict that replaced his own revenue officials with the Company's representatives. Over the next several decades, the East India Company, backed by the British government, extended its control over most of India, ruling with a combination of extortion, double-dealing, and outright corruption backed by violence and superior force. This state of affairs continued until 1857, when large numbers of the Company's Indian soldiers spearheaded the first major rebellion against colonial rule. After the rebels were defeated, the British Crown took over power and ruled the country ostensibly more benignly until 1947, when India won independence. In this explosive book, bestselling author Shashi Tharoor reveals with acuity, impeccable research, and trademark wit, just how disastrous British rule was for India. Besides examining the many ways in which the colonizers exploited India, ranging from the drain of national resources to Britain, the destruction of the Indian textile, steel-making and shipping industries, and the negative transformation of agriculture, he demolishes the arguments of Western and Indian apologists for Empire on the supposed benefits of British rule, including democracy and political freedom, the rule of law, and the railways. The few unarguable benefits'the English language, tea, and cricket'were never actually intended for the benefit of the colonized but introduced to serve the interests of the colonizers. 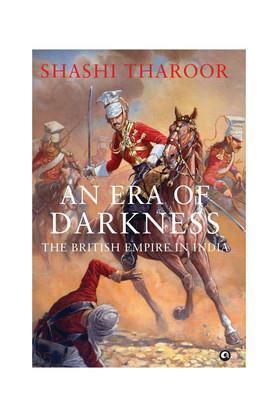 Brilliantly narrated and passionately argued, An Era of Darkness will serve to correct many misconceptions about one of the most contested periods of Indian history.